There’s a subtle difference between an Oxo tin and a Cadbury’s Roses box. Bobby Elliott certainly knows what it is. 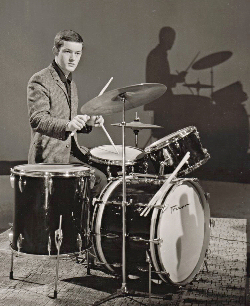 The Hollies’ backbone used to play both in a percussive arsenal which also included odds and sods borrowed from his grandfather’s plumbing business as a child. This array of “drums” also included a daily newspaper set atop the French-polished cabinet his father, a master cabinet maker, had made. “Swishing my home-made copper brushes over the newspaper was pretty realistic,” he remembers. “Sometimes, in front of our Bush radiogram, I would accompany the Benny Goodman Orchestra and Gene Krupa on a Cadbury’s Roses tin with the lid slightly askew. This produced a nice rattling snare effect, very Hound Dog, or for that funky piccolo rim-shot crack an Oxo tin was ideal. It was the early 1950s and the young Bobby Elliott was enthralled by the American big band records his Uncle Terry would play him on visits to his uncle’s home in Burnley. Modest beginnings for the boy who would grow up to become a drumming hero, and would beat Keith Moon to his first pro-job in London. 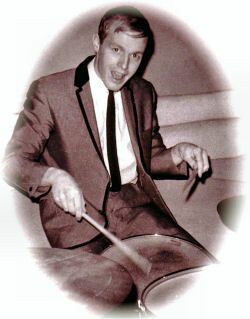 He also landed first place in the 1965 Beat Instrumental Drummer Poll, with Moonie, another Premier artist of the day, having to settle for third place. Yet Elliott is convinced his best is still to come. The Hollies, including original Tony Hicks on lead guitar and vocals, and Elliott are currently making a new record – which may include another original, Graham Nash. Planned for a release before next year’s spring tour, the new album is an exciting and mouth-watering prospect for the legion of fans as well as the current Hollies. Elliott joined The Hollies as they were on the cusp of greatness. They had taken over The Beatles” residency at the famous Cavern club in Liverpool and there was also a record deal. Rewind back to the 1950s and Elliott, from near Burnley, paid the princely sum of £2 for his first snare drum “complete with sticks and brushes”. “Then £60 for a second-hand Premier set, which I later traded in for a new ruby pearl Trixon kit from Barratts of Manchester,” recalls Elliott. “A schoolfriend, Bob Palmer, was playing double bass in a six-piece band. I would sit by the bandstand every Saturday night, waiting to sit in on three Fats Waller tunes. 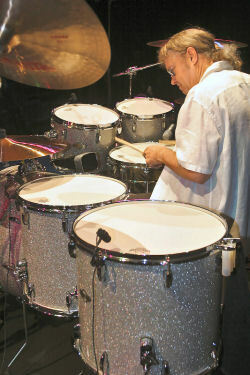 George Buckley, the drummer and leader, would at that point sing at the front, and I would slip onto the drum stool. It was heaven. Before a spell as a Fentone, backing Shane Fenton – better known in his later incarnation as Alvin Stardust – Elliott had linked up in a local group with a 14-year-old teenage guitar sensation called Tony Hicks. The first piece of The Hollies” jigsaw was in place. “I”d heard of this local kid, Tony Hicks, who had a band called Ricky Shaw And The Dolphins. They were good and Tony was a fine young guitarist. I got to know the guys and soon I replaced the drummer. I was now a Dolphin. His musical savvy, groundbreaking drumming style and the harmonies offered by the rest of the group immediately set them apart from the swathe of other Britpop bands of the day. Not that The Hollies were just a singing group – far from it. The holy trinity of Elliott, bass player Eric Haydock and lead guitarist Tony Hicks was arguably the tightest rhythm section in 1960s pop. The third single, and the first with Elliott resident, was Stay, recorded in eight in October 1963, and rising to number eight in the charts. The Hollies had arrived. The next release simply cemented their growing reputation – Just One Look. It hit number two in the UK and remains a staple of 1960s compilations. The benefits were more than just radio-play, television appearances and sold-out concerts. Elliott had penned the B-side, Keep Off That Friend Of Mine, with Tony Hicks – their one and only collaboration, and enjoyed a royalty deal the same as the A-side”s writers. But for many it was his drumming across the track that shone out. It never seemed to detract from the delightful harmonies, soulful lead and melodic bass, but at the same time pulled away from the standards of the day. 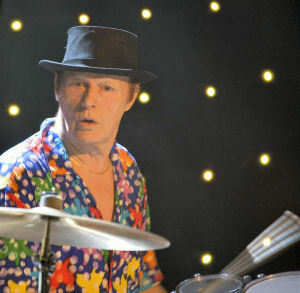 Here was a drummer not afraid to be different. Always playing for the song, Elliott found ways of accentuating the vocal harmonies with his snare and cymbals. His light touch but thunderous approach propelled The Hollies, who recorded their first album at the time of the Just One Look sessions in January 1964. “My approach has never really changed,” says Elliott. “I play better now because I”m working with fine musicians. I have to be good because Tony and the Merry Men set such a high standard. 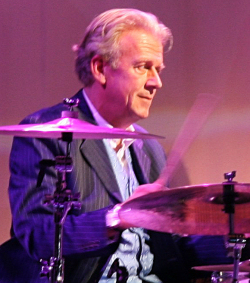 Elliott namechecks other drumming inspirations on The Hollies” website, including Larry Bunker, Joe Morello, Sonny Payne, and, of course, Gene Krupa. Jazz sensibilities married to pop made The Hollies different. Another difference was the bands ability to sustain line-up changes and keep on pleasing, with the loss of bassist Eric Haydock, coming before their American breakthrough, one of two-Graham Gouldman penned hits, Bus Stop. 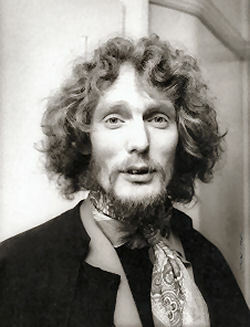 Graham Nash was next to quit, for Crosby, Stills, Nash and Young, and in the early 1970s vocalist Allan Clark left, before being welcomed back into The Hollies fold a few years later. Elliott and Hicks have remained the ever-presents of the classic Hollies line up. “I heard a 1967 or 1968 live version of Times They Are A Changin” that I quite like,” the modest Elliott says of his own playing. But fans and fellow drummers are hard pushed to name the quintessential Elliott track. 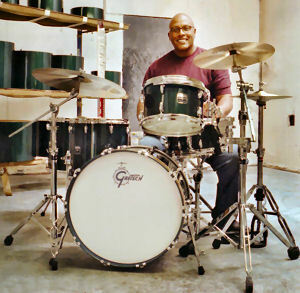 “He was so good”, remarked Gilson Lavis recently in a mikedolbear.com interview. While the hits dried up after the 1974 UK number two, The Air That I Breathe, The Hollies never stopped touring or releasing albums. The covers kept on rolling, including a 1980s tilt at The Supreme”s classic, Stop In The Name Of Love, and a tribute to Bob Dylan – The Hollies Sing Dylan. They also got to play an album of Buddy Holly covers. 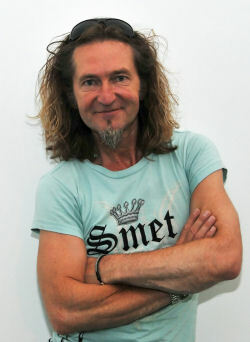 Holly was a key inspiration for the group in the early days, although talk they were named after him is generally played down for a more mundane explanation. While this activity didn”t win them many new fans, it kept them busy and on the road. Arguably, history has been unkind to The Hollies. Arguably history has been wrong. Leading hit-makers of the 1960s – and yes, they had more hits than The Beatles – the lack of original songs seems to have counted against The Hollies in some circles, especially given the wealth of exciting home-spun hits for The Beatles, The Kinks, The Rolling Stones and The Who, amongst others. But Elliott, fiercely proud of The Hollies’ canon, says: “What about our hits? We’re Through, Stop Stop Stop, On A Carousel, Carrie Anne, King Midas in Reverse, Jennifer Eccles, Long Cool Woman, which was a number one in the USA, to name a few. Plus we wrote most of our albums ourselves, and, in 1966 Tony, Graham and Allan wrote almost all the songs for our idols, The Everly Brothers, on their ‘Two Yanks in England’ LP . Not that it matters much if The Hollies did play other people’s material. For Elliott and his fellow Hollies never merely played a song, they made it. Witness Elliott”s insistent ride pattern and stop-start drumming on their first chart-topper, 1965”s I”m Alive, or his groove-laden playing on The Air That I Breathe. His effortless style and clowning belied the fact that he was driving the band and becoming an inspiration for future drummers, from Ian Paice to Gilson Lavis, to Cozy Powell and Ric Lee, not to forget a million and one amateurs and air drummers. Perhaps The Hollies greatest success is down to beer. Not that they were a raucous partying band of brothers, more the fact that their 1969 number seven He Ain”t Heavy, He”s My Brother was revived in 1988 for a television commercial. The subsequent re-release topped the charts and became akin to a signature tune. History was suddenly being kind to The Hollies. All manner of hit compilations were released, ushering in a new era of fans. Twenty years later, and 45 years after that first hit with The Hollies, Elliott and his merry men are still going strong. “Being a director of Hollies Ltd is a full-time job,” admits Elliott. “There are always requests and enquiries from around the world on licensing songs from our catalogue. But sometimes I play drums down the pub with local musicians. Performing is important to me, as long as it”s fun. “The last show The Hollies played was great. I”m now focusing on the next in Holland. Elliott remains a drummers” drummer. He still has the sideboard his father made that doubled as his first newspaper “drum kit”.